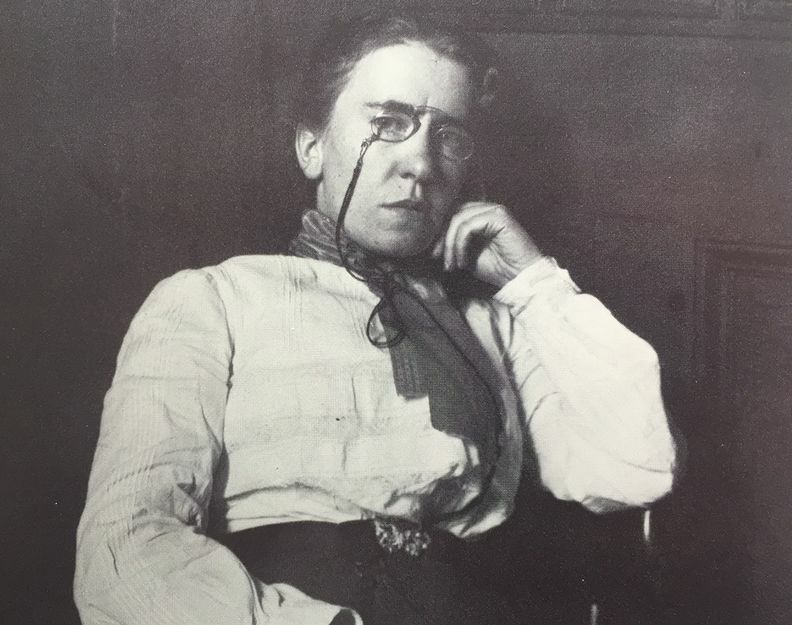 Emma Goldman came to town and Alexander Horr, Cassius Cook, Dr. Fritz, and I planned her meetings. She had been in San Francisco about a year earlier, speaking on pacifism, and five thousand people in her audience had been electrified when a young man in the uniform of the United States Army walked up to the platform and shook her hand. This soldier—William Buwalda by name—was followed to the Presidio by plainclothes men, was arrested, court-martialed, and sentenced to five years' imprisonment. He was subsequently pardoned by President Theodore Roosevelt, after serving ten months of his sentence, and had been at liberty for only a fortnight or so when Emma returned. Although he had attended her meeting only out of curiosity, he had become an Anarchist during his months in prison, and had sent to the Secretary of War, with a scornful letter, the medal he had won in the Philippines. With such proof of Emma's influence, it is no wonder that we believed the revolution was at hand. On this second visit Emma was arrested and charged with "conspiracy, making unlawful threats, using force and violence, and disturbing the public peace." She was held under $2000 bail, and Cassius Cook and I helped to raise the money. While she was in jail, I carried her meals to her daily, and she was grateful, though, of course, she couldn't resist making satirical remarks about my vegetarianism. She also scolded me for making so little of the opportunity that had been provided by the scandal over my contract marriage. [Lucy had made a 5-year agreement with her husband Bob Robins when she agreed to marry him at age 15 and he was 20, that they would automatically end it after 5 years with the provision that they could renew if it they both wanted to. In San Francisco somehow this "contract marraige" hit the news as a scandal and as evidence of Lucy being manipulated by her unscrupulous husband, and that she was not much different than a prostitute.] "I'd have started a campaign against the churches," Emma shouted. "I'd have proclaimed to the whole world that I believe in free love." Next day she reached through the bars of the visiting room and clung to me, tears rolling down her cheeks, as she told me of the death of her father. Recalling a Jewish religious custom, she asked me to give my package of food to the women prisoners who were mopping the floor. She told me al ittle about her family. "The poor old folks," she said. But in the next breath she flew at the guard, who had said something kind. "If you had a heart," she cried, "let alone a mind, you couldn't be a jailer." As I walked home slowly with the empty dishes, I wondered what Emma expected of human beings. I knew that I could never be a great revolutionist. On the one hand, I was too soft not to respond to sympathy and friendliness from whatever source. On the other, I was too stubborn, to fond of my own way, to submit to the discipline of a revolutionary movement. 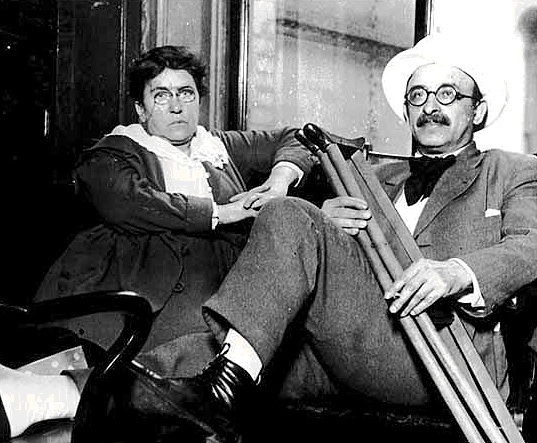 Emma Goldman and Alexander Berkman, famous anarchists of the early 20th century, pictured here in New York a year after a 2 year stay in San Francisco. Emma Goldman and Alexander Berkman lived in the 500 block of Dolores Street while they published The Blast, a forthrightly subversive periodical ultimately shut down by the federal government. Goldman was deported to Russia in 1920. 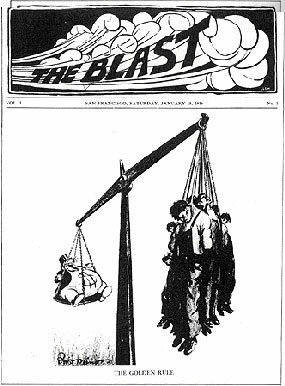 March 15, 1917 Masthead of The Blast, an anarchist paper. 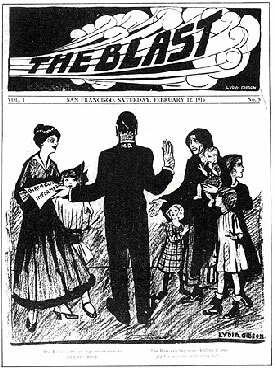 This issue's cover dedicated to efforts at the time to promote birth control.